ကျွန်တော်ကတော့ isa server နဲ့ပတ်သတ်ပြီး သိပ်မသိပါဘူး . . .အခုမှ လေ့လာသင်ယူနေတုန်းပါ . . . ကျွန်တော်စဉ်းစားမိတဲ့ အကြံတစ်ခုပေးချင်ပါတယ် . . . Bandwidth Control လုပ်သင့်တယ်လို့ထင်ပါတယ် . . . အဲ့ဒါဆိုရင် သူဘက်က ဘယ်လောက်ပဲ ပွါးသုံးသုံး . .ကိုယ့်ကိုမထိခိုက်တော့ပါဘူး . . . ဥပမာ ။ ။ သူ့ကို 100K နဲ့ Limits လုပ်ထားရင် သူ့ဘက်က 10 လုံးပွါးသုံးလညး် သူ့ဒေါသနဲ့သူ တစ်လုံးကို 10 K ပဲရတော့မှာပါ . .
ဥပမာ .. ဆာဗာတစ်လုံးကနေ နောက်ထပ် ဆာဗာထပ်ခံပြီး မပေးနိုင်အောင် ပိတ်သလိုမျိုးပေါ့ .. In the console tree of ISA Server Management, click General. In the details pane, click Configure Flood Mitigation Settings. 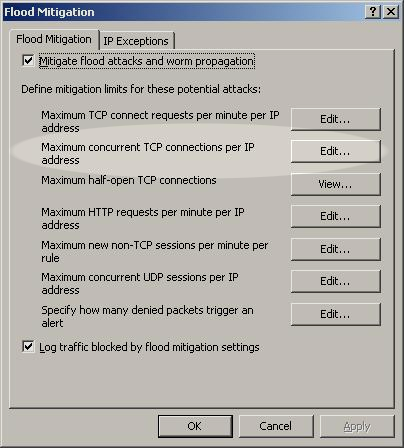 On the Flood Mitigation tab, edit the setting for Maximum concurrent TCP connections per IP address. 5. To override the default connection limit for specific IP addresses, in Custom limit, type the maximum number of connections allowed for specific users. Marshal suggests a minimum value of 2000. 6. On the IP Exceptions tab, click Add. Add the address of the WebMarshal server. အဲဒါလေး အကိုရတယ်ဆိုရင် ဒီနေရာလေးမှာ ပြန်ပြောပေးပါဦးနော် ..